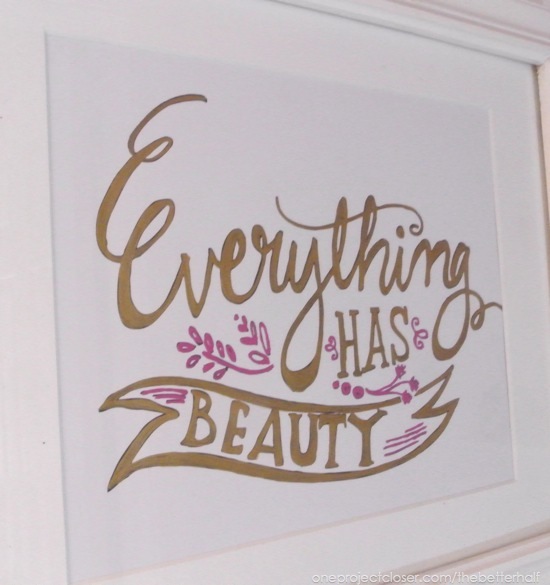 Last week, you may have seen my vanity makeover using Con-tact Paper and I said that there was more to come, and sure enough, there is. Maybe I went a little crazy with the Con-tact Paper, but I really love it!! 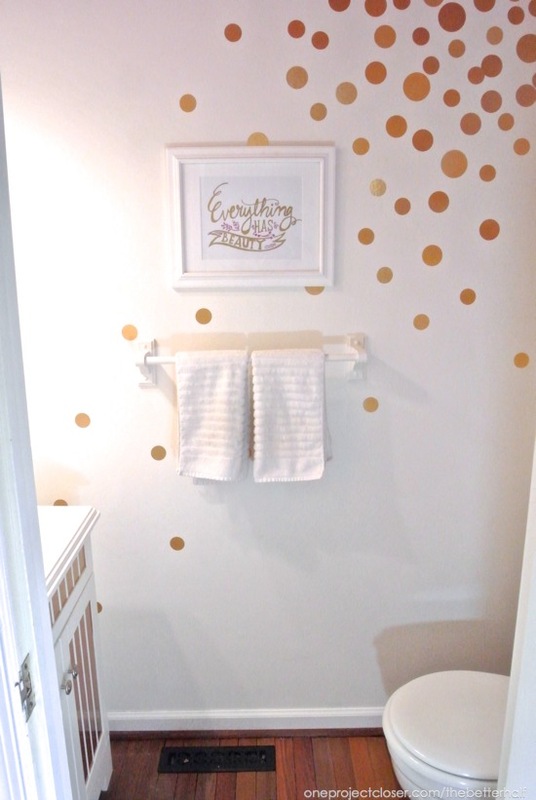 Without Further ado, here’s my bathroom Makeover with Con-tact Paper! Here’s how the bathroom started. 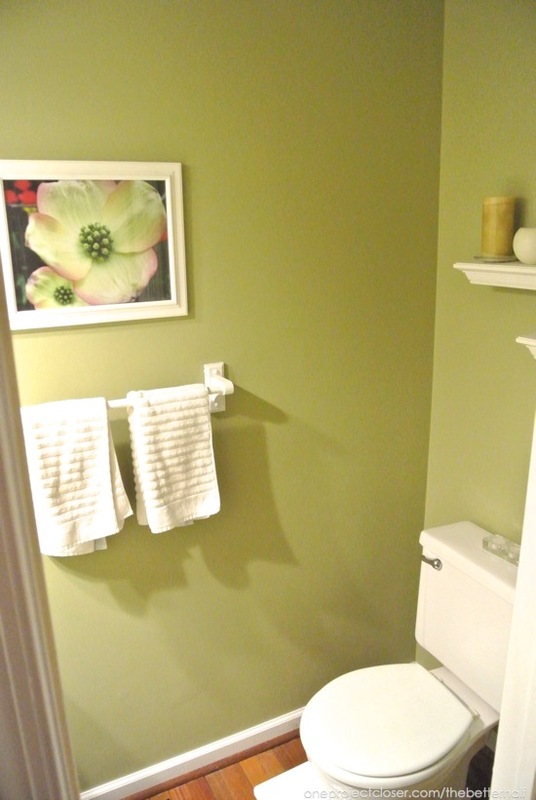 I painted it green (one of my favorite colors) about 8 years ago when we moved into the house and we upgraded the floors and vanity. 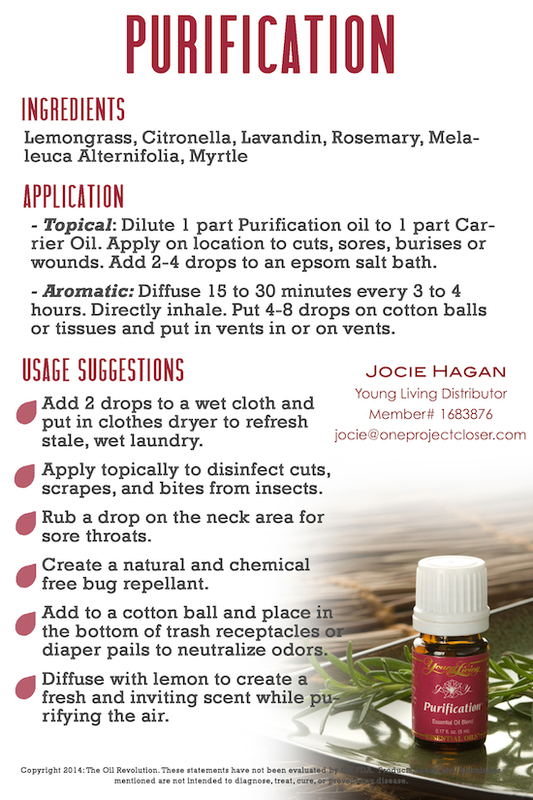 I use Purification for lots of other stuff, but here’s a little info if you’re interested. 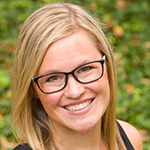 If you wanna chat about oils and want to before a member of my team, email me at jocie@oneprojectcloser.com. Once done painting, I used my Silhouette to cut out varying size circles of Metal FX Con-tact brand paper, then I stuff them to the walls. It seriously only took 30 minutes or so! Btw, I am not an affiliate or paid by Con-Tact Brand for this post, just mine own fun and ideas. I added a few new candles and changed out the artwork. 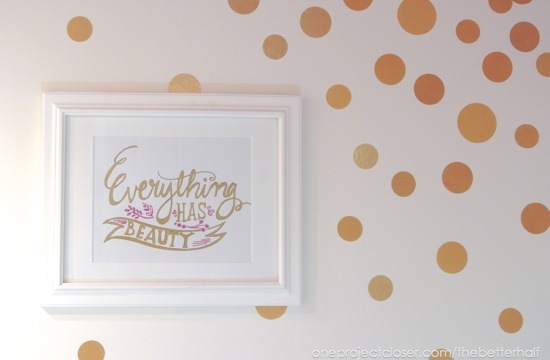 Super easy project – I printed out a Rhonna Designs graphic and used gold and leftover ceiling paint to trace over the print out, then framed it! As I painted, the irony of the message struck me. I guess not EVERYTHING in the bathroom has beauty. lol. And finally, I added a few swirls around the mirror. I’m not totally thrilled with that and may end up changing it. What do you think?? I feel like its to artsy. Here’s a few more shots of the makeover, just for fun! Ethan’s only comment was that we should call it the Champagne bathroom! I love it! Maybe I should leave a bottle of champagne in there, or is that crossing a line? haha. What do you think? 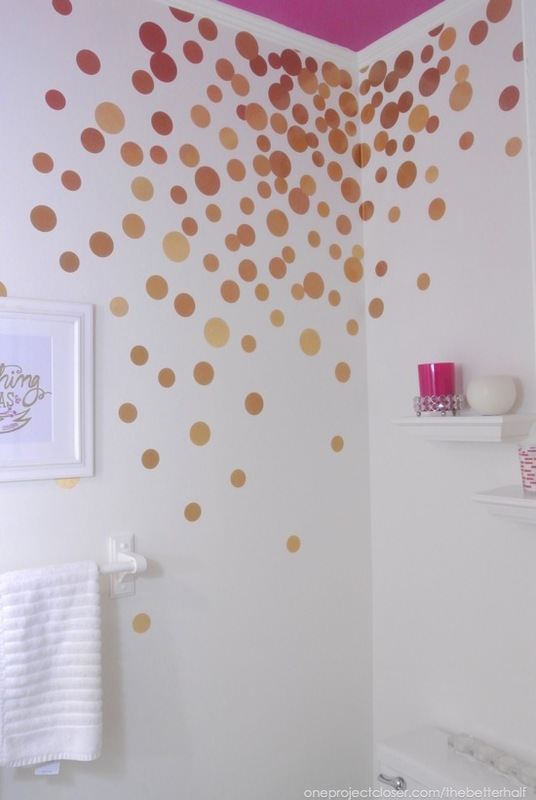 Do you like this bathroom makeover using Con-Tact Paper? Too over the top, or just right? These statements have not been evaluated by the FDA. 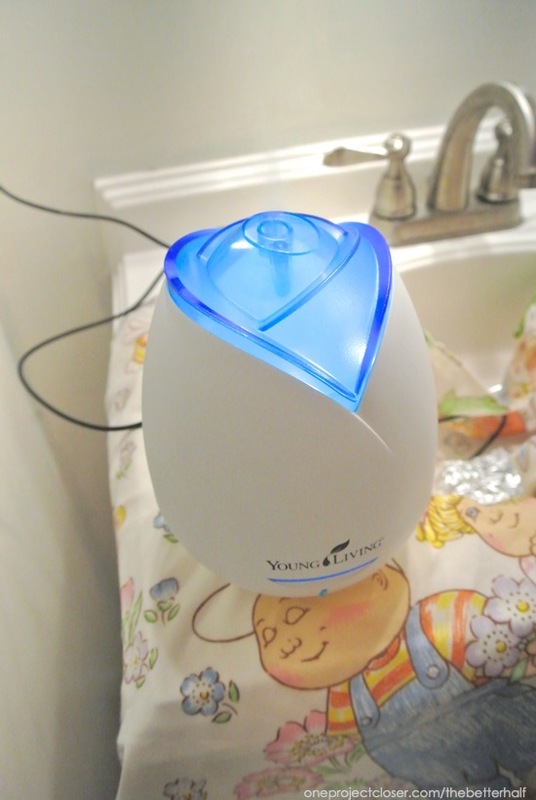 Products, ideas and techniques mentioned are not intended to diagnose, treat, cure or prevent any disease. I love love love your new bathroom! I LOVE this! So glamorous and fun at the same time. Love the ceiling. Leave the mirror swirls, at least for a bit. They’re special. Definitely accessorize with a bottle of bubbly. Great call by your husband, and the champagne bottle will cross the t’s and dot the i’s. A very fun room. I’d say it’s over the top, but in a half bath I think that’s the way to go. They’re not so big that “over the top” is overwhelming. Instead, it’s just plain joyful! And there’s nothing wrong with that feeling. I love it. As for the mirror, maybe you didn’t go over the top enough. 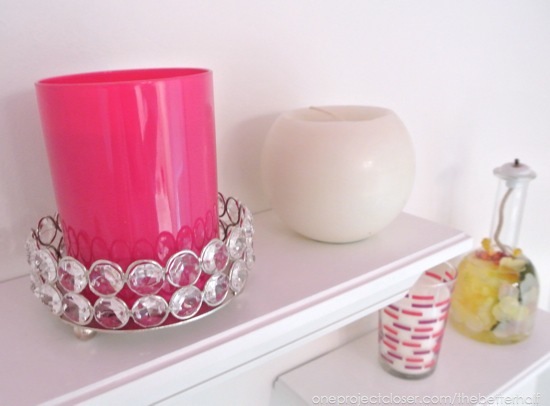 What about finding some mosaic tiles the color of the contact paper and gluing them around the edge of and on the mirror as a glitzy frame? Another idea would be flat backed marbles. You could probably find them to match both the ceiling color and the contact paper. Just a thought. First of all…I have those Cabbage Patch Sheets. 😉 Your bathroom is amazing!! I love that you painted the ceiling such a fun color. 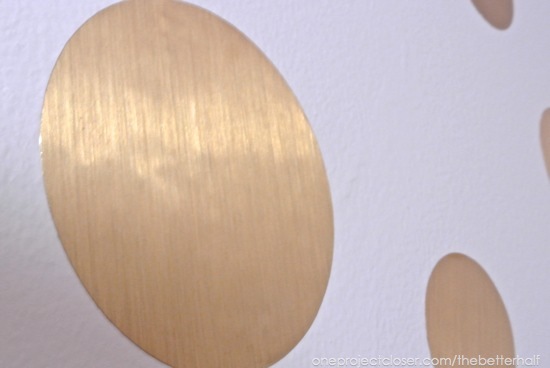 The metallic circles on the wall are cute! And i really like how the fuschia pops against the wood grain in the floors. The swirls around the mirror may be a touch too much. 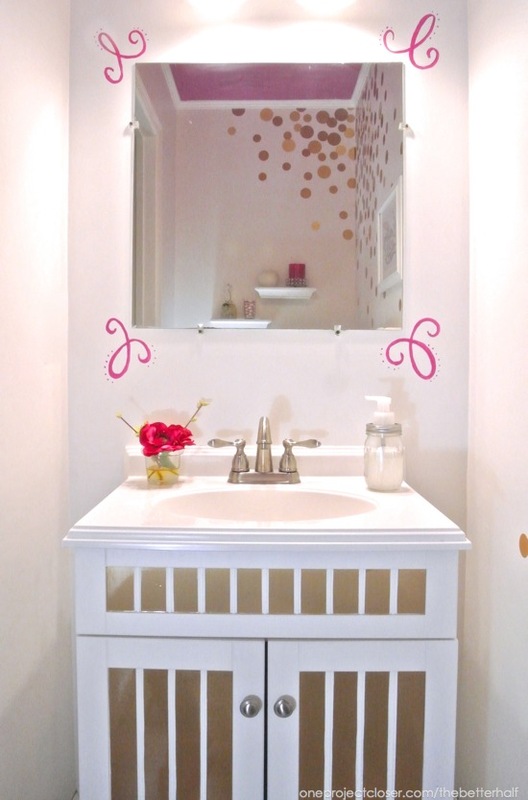 Maybe paint a frame for the mirror in the fuschia color instead to pull the color down into the space more? This is gorgeous, Jocie! 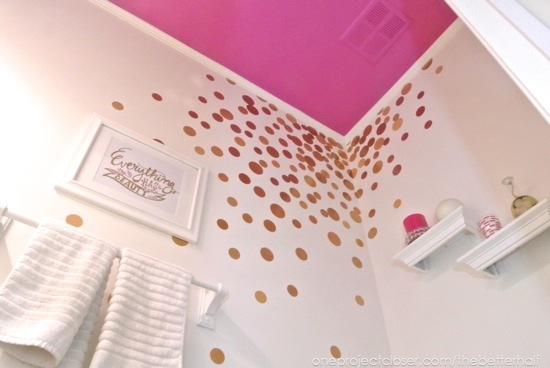 Love the pop of color on the ceiling and those fun dots!! IN LOVE WITH YOUR BATHROOM! Girl… you are so fun!